It often helps for beginning players to have advice on how to play D&D. Many points are overlooked by novices is their eagerness to get on with the adventure, The following points are given to help these players. Most importantly, players should be organized and cooperative. Each player should have complete information on his or her character easily on hand and should supply the DM with this information quickly and accurately if asked. As parties will usually involve a variety of alignments and classes, players should work together to use their abilities effectively. Arguing among players will cause delays, attract monsters, and often result in the deaths of some or all of the members. Cooperation should also be given to the DM. He or she is the judge of the game and his or her decisions are final. 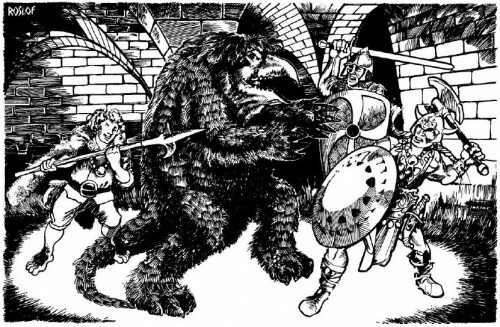 If a player disagrees, he or she should calmly state why, and accept whatever the DM decides. Shouting, crying, pouting, or refusing to accept decisions only angers the other players. The game should be fun for all involved. Not everything will go the way players want it. Caution is also necessary and is a part of planning. A party that charges forward without preparation is almost certainly doomed. Danger should be expected at any moment and from any direction, possibly even from one’s own party. Lying and trickery are not unknown. Cautious play will help avoid many (but not all) tricks and traps and may save a life. However, too much caution is as dangerous as too little. Many instances will require bold and quick actions on the part of the players, before all is lost. Above all a player must think. The game is designed to challenge the minds and imaginations of the players. Those who tackle problems and use their abilities, wits, and new ideas will succeed more often than fail. The challenge of thinking is a great deal of the fun of the game. It’s like a Five Commandments of tabletop roleplaying. They keep releasing new rules and we keep adapting our own house rules, but the game’s the same it’s always been in the ways that matter most. This entry was posted in DnD on January 30, 2015 by Burrowowl.